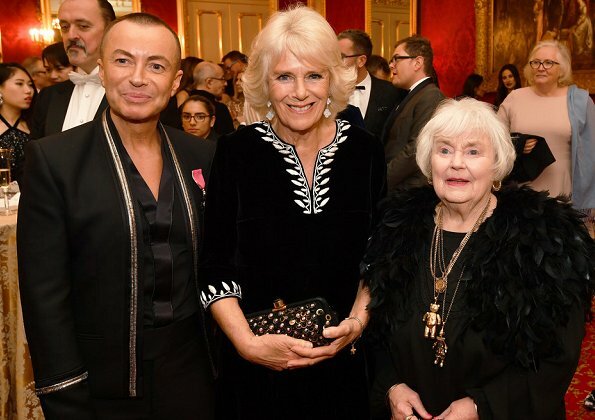 On November 21, 2018, The Duchess of Cornwall attended the Julien Macdonald Fashion Show held for the benefit of National Osteoporosis Society at Lancaster House in London, England. The purpose of the Show was to raise life-changing funds and awareness. 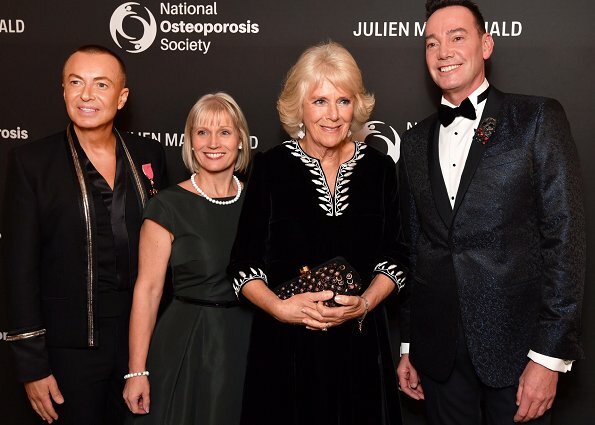 The Duchess of Cornwall was made President of the National Osteoporosis Society in October 2001. 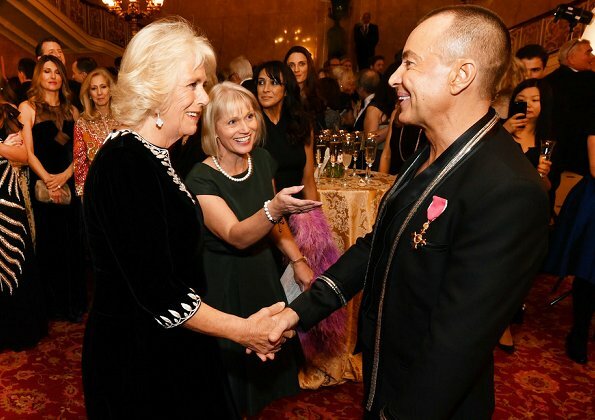 The Duchess has been an ambassador since 1987 and continues to work on behalf of the charity and all those affected by osteoporosis. Great dress, even better earrings. I think people don’t give her enough credit for accepting her wrinkles as they are. She looks so pretty with them. Lovely! I think we all should do like she: find a flattering and easy to wear dress model and have it made with little variations. Details like this dress has are not vety difficult to make, but they do make a difference. What a lovely dress! Black suits her surprisingly well. How lovely is she? 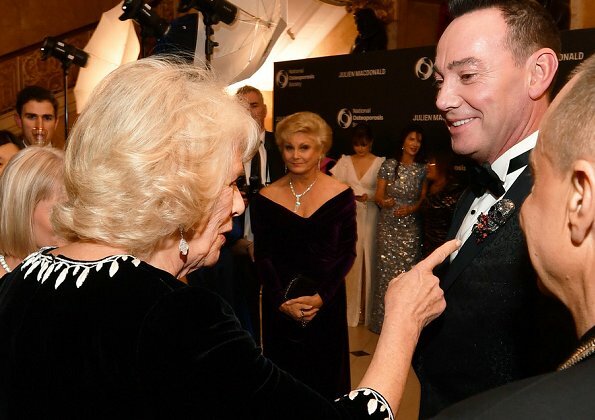 And I must agree that her way of accepting wrinkles and other age marks is a remarkable example for all to follow. Great job! Absolutely agree. She loooks great. Watch out that the body shaming complainers don't get you for daring to comment on wrinkles !! 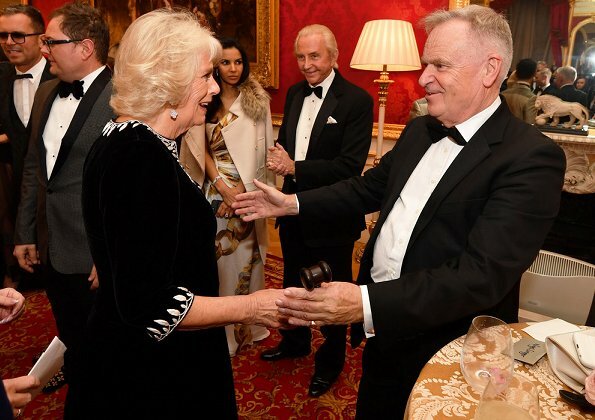 Like the Princess Royal, the Countess of Wessex she works away tirelessly for so many causes without generating the media attention that attends Catherine or Meghan. Which is sad because all three of them work tirelessly for great causes. And the Princess Royal needs to have a documentary made on her. I mean that woman does scores of engagements. 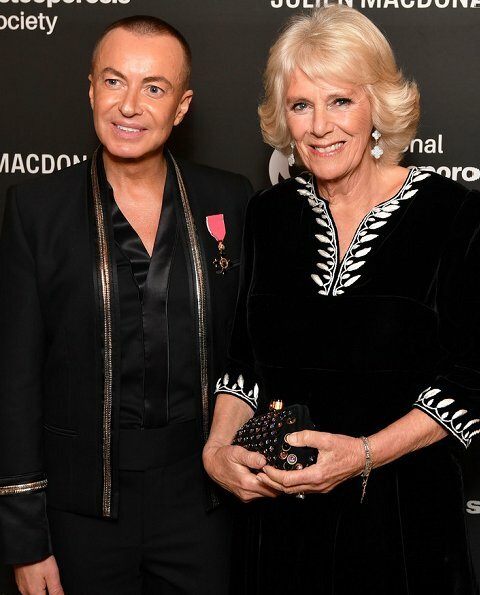 And Camilla has done lots for literacy and abuse and Sophie for preventable blindness and many other causes. Lovely. I really like the dress and the earrings are great. Fabulous appearance. Her dress, earring - everything looks very stylish. I think she has a stylist and a pretty good budget to spend on her appearance and bespoke outfits. Of course she has got a stylist. I think there‘s one in each advisory team. Meghan‘s stylist has just quit. Meghan takes style advice from her friend. An assistant from her office has just left. I really like Camilla! She has a certain style that she knows works well for her season of life. She looks lovely. 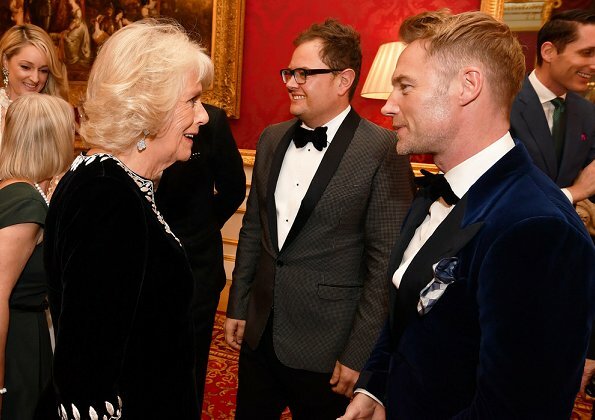 I think Camilla's mother had osteoporosis and that's why she got envolved with this National Society... Like her outfit that suits her well.